Some international careers require an in-depth knowledge of protocol. My friend, Benedicte Valentiner, is a good example. She served four presidents as general manager of Blair House. Her book with the title Bedtime and Other Stories from the President’s Guest House is a great read for those interested in the care and feeding of world leaders. Many international jobs require at least a rudimentary knowledge of protocol. There are scary examples of international incidents that could have been averted if those involved had received basic training in topics ranging from appropriate seating at formal dinners to flag placement in cultural traditions. My young colleague Kim Starfield, who serves as Assistant Protocol Officer for the Secretary of Homeland Security, told me about an upcoming Protocol 101 Workshop on May 16. It is sponsored by the PDI-POA: Protocol Officers Association. Mark and I often write about the building blocks of your career. Knowledge of protocol is certainly one. Dr. Mueller’s advice that knowledge of protocol is an essential element to a successful international career is right on the mark. 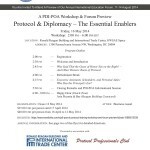 Although indispensable to the conduct of diplomacy, protocol also plays an important role in all aspects of international interactions, whether they are business transactions, educational exchanges or simply social encounters. Understanding and applying protocol principles enables us to avoid distractions, embarrassments and surprises, to identify and resolve problems before they occur, to provide order to proceedings, and to create a positive and friendly environment, facilitating the conduct of the business at hand.